The Linx target acquisition system proved its value and is part of the future configuration. © Selex Elsag. The first 30 Soldato Futuro kits from the Development Phase contract have been delivered since early 2011, and have been thoroughly tested by operational units. A further 62 will be largely delivered by the end of the year. Of these, eight of these have been modified to the so-called Forza NEC standard, and are known as “precursors” with their delivery being awaited in late 2011-early 2012. Compared to the Development Phase system, the Forza NEC version will be updated in several areas. The most important of these being the adoption of the wideband SWave Handheld Software Defined Radio, developed and produced by SELEX Elsag, the Finmeccanica company born from the merging of SELEX Communications and Elsag-Datamat. 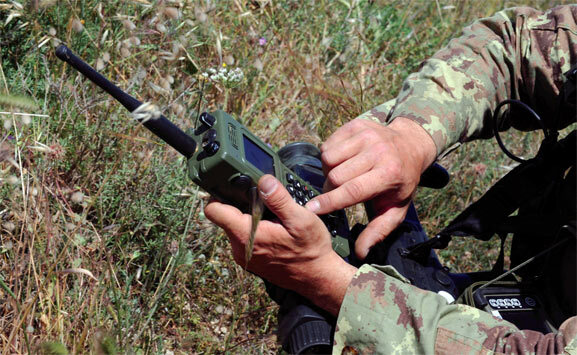 While the previous Individual Pocket Radio (IPR), operated in the 800-900 MHz band and had a 1,300 m maximum range the new SWave Handheld single-channel multi-mission radio covers the 30-512 MHz frequency and currently supports five types of waveforms, VHF FM military Tactical and AM, VHF and UHF EPM EASY II and UHF AM/FM Military Tactical. Typical line-of-sight ranges vary from 2 to 5Km respectively for wideband and narrowband waveforms, thanks to its 5W maximum transmission power, the user also being able to select 100mW, 1.25W and 2.5W output levels. The other key factor is that the SWave HH is its inherent capability to handle data, something not available in the IPR which needed a node which was part of the wearable electronics to provide data capacity. When using the SBW UHF EPM EASY II proprietary waveform developed by SELEX Elsag, SWave HH radio users can exploit advanced networking services such as Mobile Ad Hoc Network (MANET) connectivity and Multi-Net voice operations. Up to 50 units can form a mobile wireless network exploiting the 2 Mbps data rate provided by the new radio, a throughput that also allows the handling of streaming videos. The SWave is fully secured with embedded COMSEC encryption and frequency hopping TRANSEC features. Voice traffic has higher priority over data and Multiple Voice Nets are supported allowing i.e. creating separate voice nets for Squad and Platoon commanders as well as for each Squad. The SWave has a weight of 800 grammes without battery, slightly more than the IPR; however the weight balance is favourable considering that the node in the electronic package has been eliminated. The SWave HH is 220mm long, 70mm wide and 50mm deep, and operates between –30°C and +60°C. Testing the Soldato futuro kit in its original form, with Selex Galileo Nimos, ICWS and grenade launcher FCS. © Selex Elsag. The other major change in the electronics package is the adoption of a single Li-Ion battery. In contrast, the original system had two batteries, linked by a connection bar. The single battery has a weight of around half a kilogramme and provides 70Wh of energy, enough to power the Soldato Futuro system for eight hours. A new connector includes a lightweight system allowing the ‘hot swap’ of batteries in 30-60 seconds. Increased mission duration CBU/ADI battery chargers have been provided by Larimart. These are available in the Freccia 8x8 infantry fighting vehicle with each Freccia having two systems that can connect up to four soldiers both to reload batteries in use, and host up to four additional batteries. The reloading time for an empty battery is of about four hours. Similar systems will equip also the Iveco DV VTMM and Lince medium and light armoured vehicles. To keep the system loaded when not in use, Larimart developed the CBU/SFP, a trolley-like system that not only hosts all the Soldato Futuro equipment including the rifle but is wired in order to be plugged into a DC or AC power source, ensuring optimal reloading. The CBU/SFP is also wired as a LAN and thus allows the updating or mission-configuring of system computers. The computer hardware has not evolved significantly, with only component upgrades having been considered. What has changed considerably, with the advent of the SWave is the software. The new configuration is awaiting field testing but will not be issued with all the 62 new kits, but will be limited to eight kits known as “precursors”. These will also be equipped with new items related to rifle sighting and night vision. 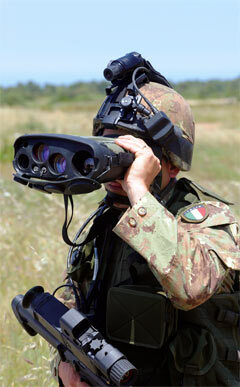 In 2010, SELEX Galileo provided its Individual Combat Weapon System (ICWS), NIght MObility System (NIMOS), Grenade Launcher Fire Control Sight (GLFCS) and Linx target acquisition system. The latter two were accepted with a built-in GPS being added to the Linx, while the former two did not meet requirements in terms of performance versus weight. This was mostly due to delays in technology evolution that did not allow for the performance forecasted at the beginning of the programme, thus further development work was needed. The need to deploy the 558 kits for operational experimentation, before launching a further 1,025 Forza NEC kits to equip two additional regiments completing the first digitized brigade, brought SELEX Galileo and the Army to agree on the adoption of third party equipments to replace the NIMOS and ICWS at this stage. The NIMOS interim replacement should be the AN/PVS-21D NVG that allows data injection, which means that it will be integrated with the electronic box. The Army is also looking for other solutions capable to fully satisfy the NIMOS initial requirement. As for the ICWS, its interim replacement will be formed by an optical sight coupled to a clip-on thermal sight, the Raytheon Elcan SpecterDR 1-4x and L-3 Insight Mini Thermal Monocular being apparently on top of the list. To provide information in the NVG, this will be integrated with the electronics box. Following the delivery of the 62 kits, the validation process should last about two months; this will lead to the Critical Design Review that will allow the freezing of the configuration for the first 558 kits giving the green light for their production. improves the Soldato futuro performance. © Selex Galileo. Some MMI issues related on symbols and masks on soldiers and commanders displays and a shorter update time on those displays are part of the issues to be discussed as well as some mechanical improvements in order to allow a quicker battery change. One item that was initially considered is a tier two element which has now come to the forefront and is awaiting the approval by the Army: this is the new K-ration, for which the Defence Administration is reviewing its requirements exploiting lessons learned from the units deployed downrange. It will be provided as soon as possible, however it is considered a stand-alone item and thus is not slowing down the validation process. 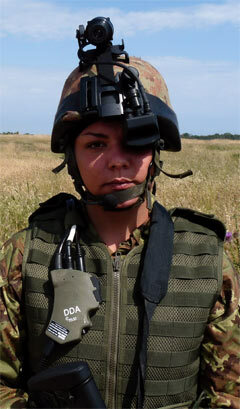 The medical kit is also being upgraded, but the major item still under development is the combat/electronic vest; a solution for optimising the vest that will also contain ballistic protection; the aim is to obtain a continuous coupling between the soldier and the Freccia energy absorbing seat for maximum protection in case of mine or IED blast. Looking forward, SELEX Galileo continues to work on its NIMOS and ICWS. The company is focusing on image fusion for its NIMOS and hopes to be ready for the 1,025 batch production, while the ICWS is being optimised in terms of weight and centre of gravity and is being modified to integrate a laser pointer which that will be mounted on a Picatinny rail. 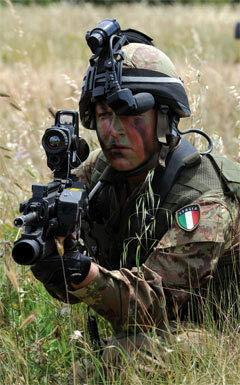 The medical kit is also being upgraded, but the major item still under development is the combat/electronic vest; a solution for optimising the vest that will become also contain ballistic protection; the aim is to obtain a continuous coupling between the soldier and the Freccia energy absorbing seat for maximum protection in case of mine or IED blast. Soldato Futuro equipped with a NIMOS head systems © Selex Galileo. In parallel with contractual deliveries, technological activities have also been started, with the goal to be drivers for the programme’s next steps. As for power availability, in 2009 technological research was launched with Larimart leading a team that includes Labor and Rome Universities for the development of a battery reloading system based upon a borane fuel cell. The aim is to have a system weighing 2-3 kg, which is able to reload the Soldato Futuro batteries for an 8-10 soldier team in 6-8 hours and will be provided to patrols operating on foot and Special Forces. Safety and transport issues were taken into consideration, and the technological demonstrator has been approved, the team waiting for the second phase contract that will result in the testing of a field demonstrator. Further research is looking at energy harvesting from kinetic energy; known as We-KERS (Wearable KERS). Larimart aims to provide sufficient energy to increase the battery durability or operate the radio and the positioning system when the battery is flat, all this without degrading the soldiers’ operational capability. Research is also being done by Larimart, in cooperation with Aero Sekur and SELEX-Elsag, to develop an electronic vest named WABS (Wearable Antenna Battery System) using conformal batteries and wearable antennas as well as new fabrics that include cabling. Larimart also aims at presenting an in-ear protection/earphone capable to be linked both to the radio and to the vehicle intercom, an item not included in the initial Soldato Futuro, before the CDR. Hopefully the next issue of SoldierMod will be able to illustrate the outcome of the testing and of the CDR and to announce the launch of the first batch production.